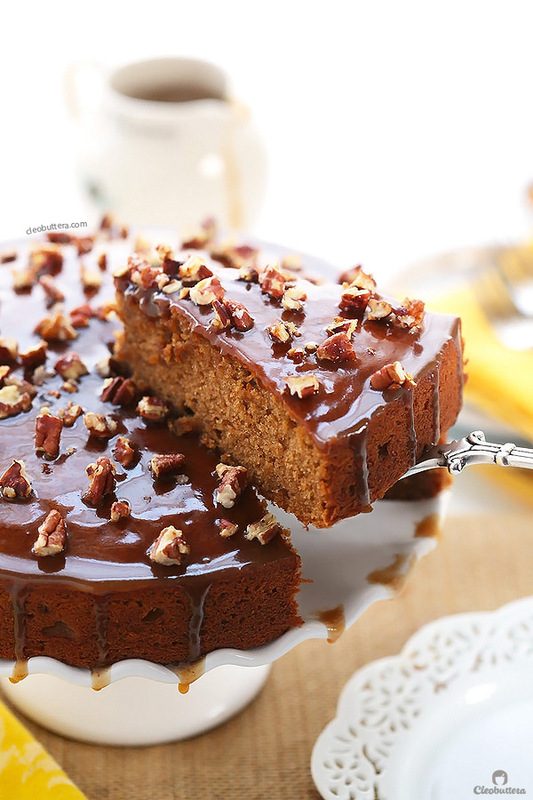 Soft and tender, lightly spiced sweet potato cake made extra delicious with fragrant browned butter in both the batter and the toffee glaze. 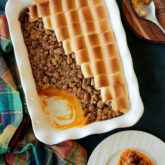 A sprinkling of salted candied pecans on top adds the perfect crunch. Sometimes you just need CAKE. Simple and cozy enough to eat midweek in your PJ’s, curled up on your couch. Yet special enough to take at a fancy brunch. 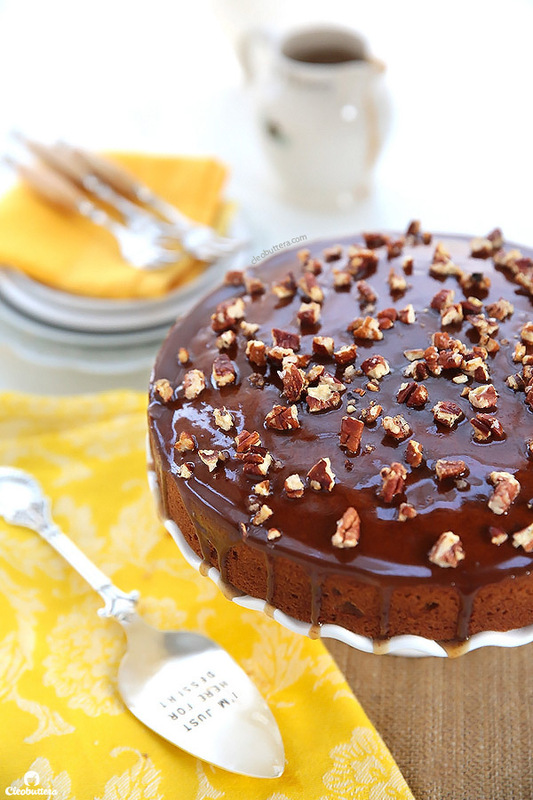 A cake that will transport your tastebuds to Pleasantville, while giving you a big, warm hug. 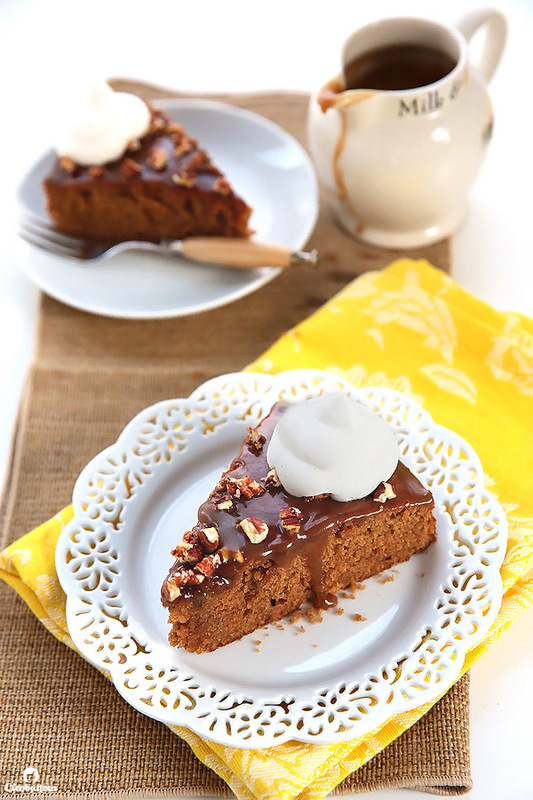 This Sweet Potato Toffee Cake…is just THAT! One layer, simple glaze, warm with spices, plush in texture and tastes just like Fall. It might not be the most creative dessert in the world, but it sure is good…really really good. So good that my Aunt (who’s famous for her fine cooking skills in the family) made it 5 times in the past 10 days after I gave her the recipe over the phone. 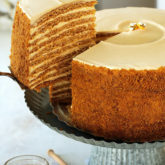 It also instantly became one of my mom’s favorite cakes. 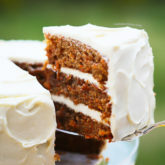 The cake is made impossibly soft with a generous helping of roasted, mashed sweet potatoes that goes straight into the batter. The sweet potato flavor is subtle, but definitely detectable and oh so delicious. 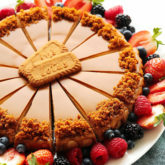 What makes this cake so special though, is that its bathed in browned butter, and if you’ve been following along for any length of time, you probably know about my infatuation with browned butter. I’ve obsessively used it here, here and here. 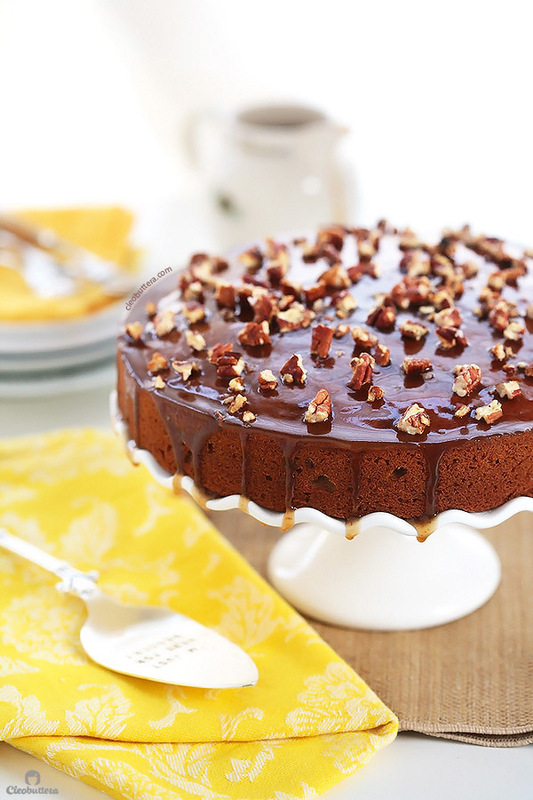 It just adds a nutty, caramel-y depth of flavor to the cake that makes you stop and take notice. The toasty notes that the browned butter brings, adds complexity to the sweet potato flavor, which would otherwise taste flat. See those golden flecks in the browned butter…MAJOR flavor baby! The cake is actually adapted from this Ultimate Pumpkin Layer Cake that I posted last year, swapping out sweet potatoes for the pumpkin puree. Which is totally NOT my idea! 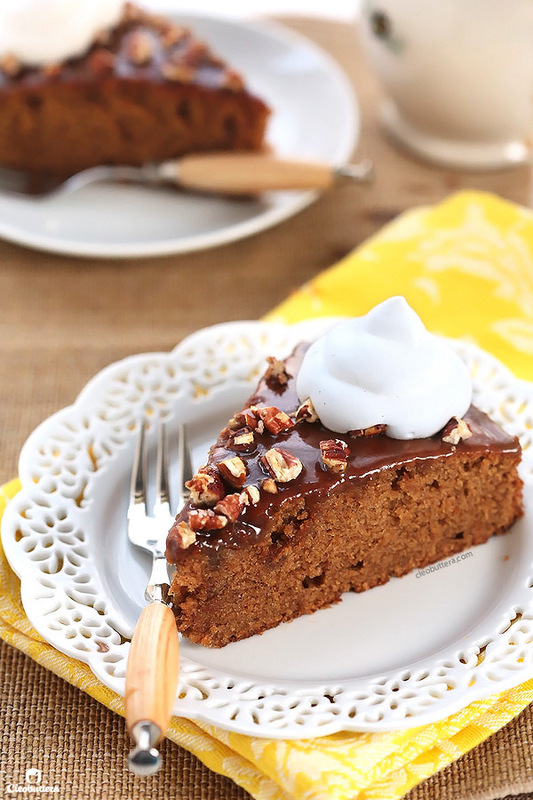 It would’ve never crossed my mind to do something as gutsy, if it wasn’t for a dear reader, Yasmine, who wanted to make the cake but was having trouble finding pumpkin puree, so she went with sweet potato instead. (I admire a risk-taker!) She said that it turned out amazing, and so I knew I had to try it. And I did. And I loved it And here I am posting it. So thanks girl for the brilliant idea! 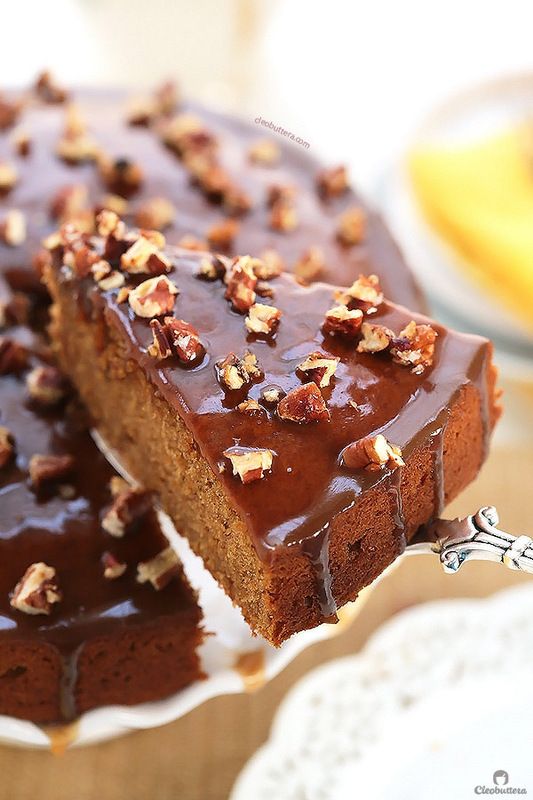 However, this time around I decided to keep it simple by halving the recipe, turning it into a one layer snack cake, ditched the frosting and browned the butter in the toffee glaze, you know…because why not? Did I just invent something? 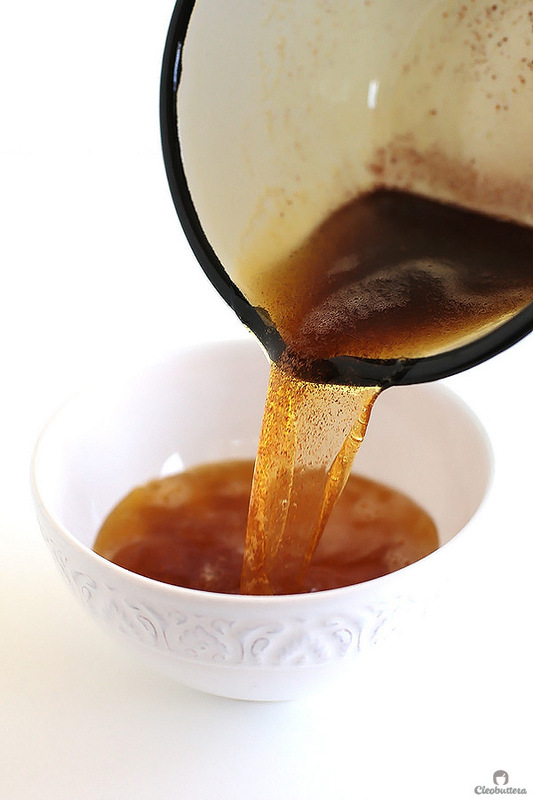 Browned Butter Toffee Glaze? If it’s already out there, please don’t tell me…let me live the moment will ya? If you’re curious…its unbelievably good! In one of my trials, I skipped the browning just to see if it was really necessary, and let’s just say that you don’t know what you’re missing until it’s gone. 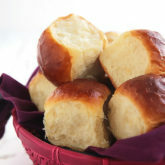 So we’re sticking with browned butter! To make the cake, you’ll need to roast some sweet potatoes. Couldn’t be easier. Stab a few times with a knife, wrap in foil and forget about it in the oven for 45 to 60 minutes. Add in some buttermilk and vanilla and mash some more. Then you’ll beat previously browned (and cooled) butter until creamy, then add in both granulated and brown sugar, and beat some more. Next goes the eggs, beating really well after each addition, then 1/3 of the flour/spices mixture. Follow that by 1/2 of the sweet potato mixture, another 1/3 of the flour, remaining sweet potato then ending with the last of the flour. 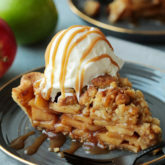 Pour into your pan and bake until a toothpick inserted in the center comes out clean or with a few moist crumbs attached. 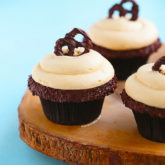 If you like a little crunch, sprinkle on some salted candied pecans, which are so yummy that they almost never made it on the cake. And enjoy Fall on a plate. Adjust oven rack to lower middle position and preheat oven to 390F/ 200C. Place the butter in a light colored skillet or saucepan over medium heat until melted. Continue cooking, swirling the pan constantly or stirring with a heatproof rubber spatula, until the butter is dark golden brown and has a mezmerising nutty aroma. Transfer to a small bowl, cover and place in the freezer, giving it a stir every now and then, for about 45 minutes or until it solidifies but is still soft and pliable. Once it reaches this consistency, keep it out at room temperature until ready to use. 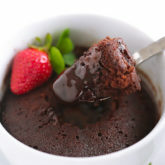 If it gets too solid and cold, give it a quick zap in the microwave to loosen but not melted. (If making a day in advance, place in the fridge instead of the freezer and let it come to room temperature before using). Meanwhile roast the sweet potatoes. With a sharp knife, pierce 12 oz of sweet potatoes 3 or 4 times to allow steam to escape. 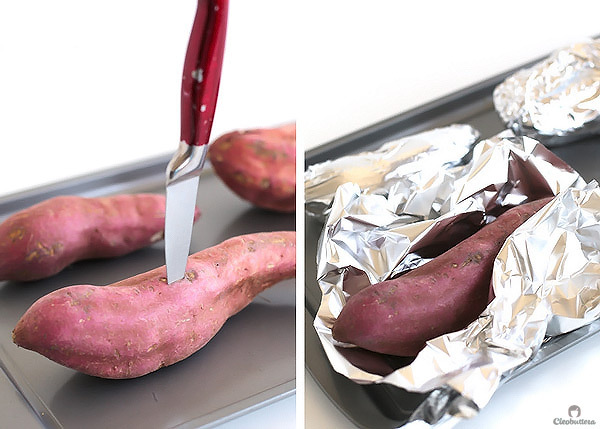 Wrap each sweet potato individually with foil. 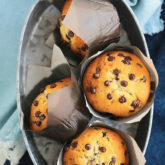 Place on a baking sheet and transfer to the oven to bake until very soft, 45 to 60 minutes. To test for doneness, a sharp knife inserted in the thickest part of the sweet potato should pass through very smoothly and without any resistance. Take the sweet potatoes out of the oven and allow them to rest until cool enough to handle. Reduce the oven temperature to 350F/180C. 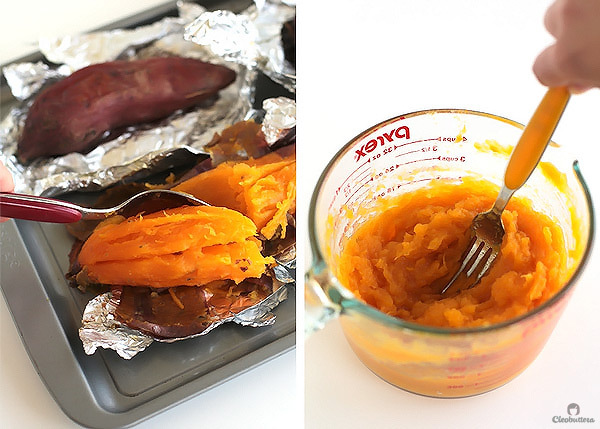 Remove and discard the foil, then slit the sweet potato skin. Using a spoon, scoop out the cooked sweet potato flesh, discarding the skin. 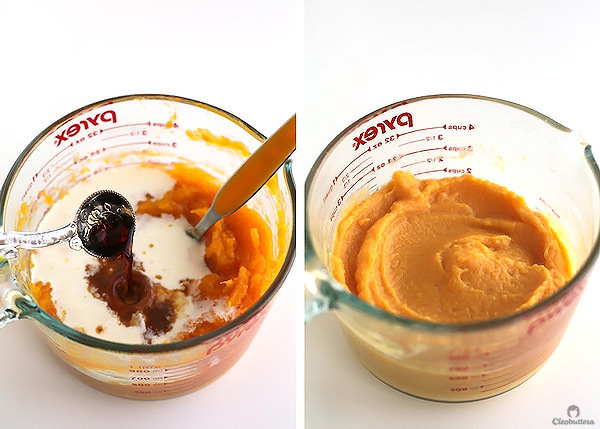 Measure out 1 well packed cup (8oz) of sweet potatoes; you might end up with some extra (save for another use). Transfer the sweet potatoes to a medium bowl, and using a fork or potato masher or ricer, mash the 1 cup sweet potatoes until very smooth. (At this point, the mashed sweet potatoes could be stored in the fridge overnight. Bring to room temperature before using in the cake). Add cold buttermilk to the warm sweet potatoes (to cool it down) and the vanilla and mash together to incorporate. 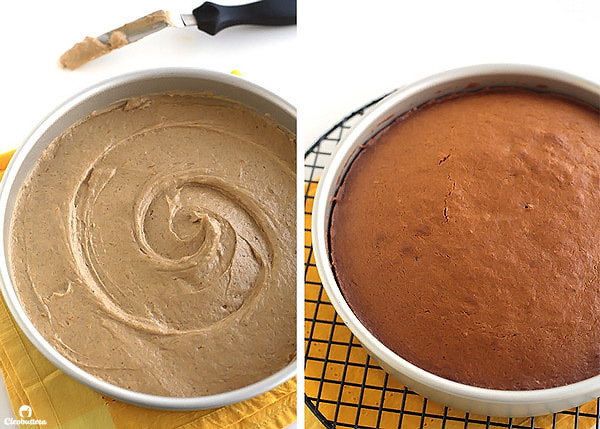 Set aside to cool to room temperature (a little warm is ok), while preparing the rest of the cake. Make sure the oven is preheated to 350F/180C. Spray a 9-inch round pan with non-stick cooking spray, line with a parchment paper round, then spray once again. 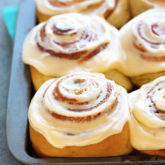 In a large bowl, whisk together the flour, baking powder, salt, baking soda, cinnamon, nutmeg and ginger. Set aside. In the bowl of a stand mixer fitted with the paddle attachment (or handheld mixer) beat the browned butter on medium high speed until creamy, about 1 minute. 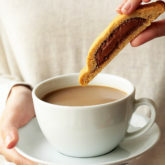 Gradually add both sugars and cream together until lightened in both color and texture; 3 to 5 minutes. 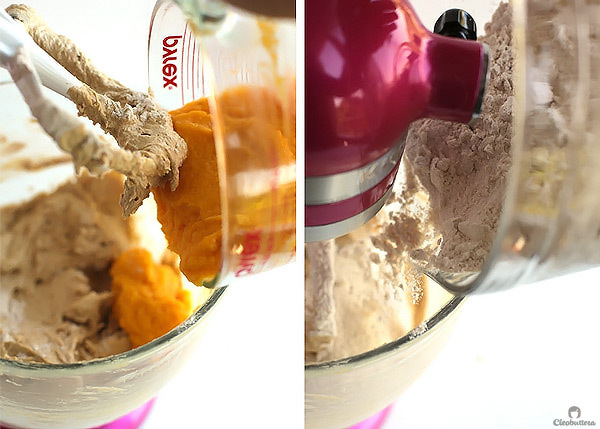 On low speed, add one third of the flour mixture, followed by half of the sweet potato mixture, then another third of the flour mixture, followed by the remaining sweet potato mixture and ending with the flour mixture, mixing just until combined between each addition. 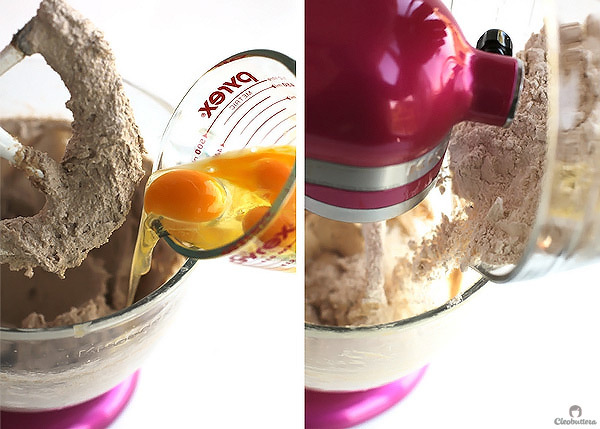 Turn the mixer speed to medium and give the batter one final mix for about 15 minutes until everything is well combined and smooth. Do not overmix. 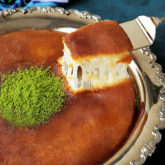 Pour the batter in the prepared pan and smooth out with a spatula as evenly as possible. Bake until the cake's center springs back when lightly touched, a toothpick comes out of the center clean and the cake starts to pull away from the sides, 30 to 35 minutes. Let cool in the pan for 15-20 minutes then turn onto a wire rack to cool completely before glazing. 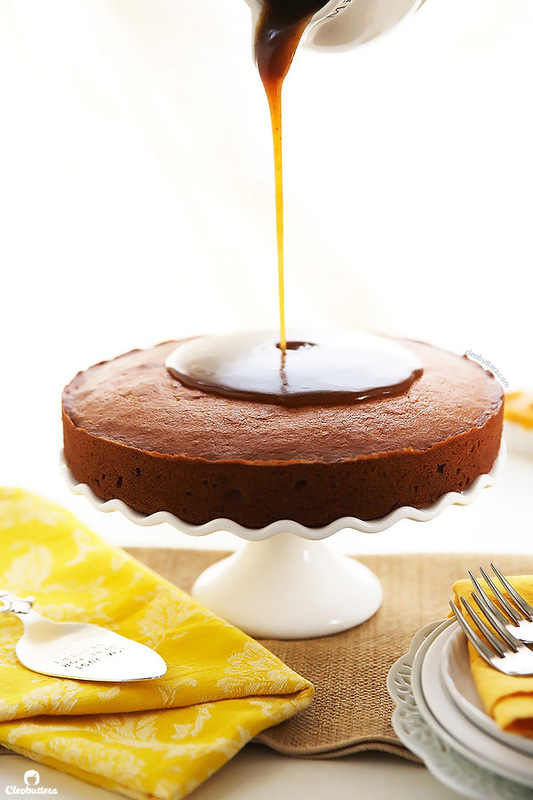 Meanwhile make the browned butter toffee glaze (recipe below). When ready to glaze, place the cake on a rimmed serving platter or cake stand. 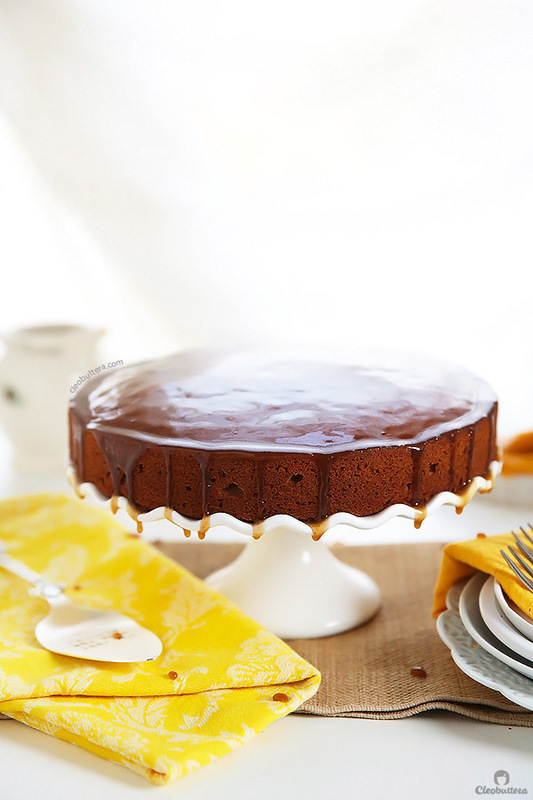 Pour the slightly cooled toffee glaze over the surface of the cake, allowing excess to drip around the sides. Allow the glaze to set for a few minutes then sprinkle with the candied pecans (if using). Cut into wedges and serve plain or with whipped cream, if desired. Store leftovers at room temperature in an airtight container. In a small light-colored saucepan, melt the butter over medium heat until melted. Continue cooking, swirling the pan constantly or stirring with a heatproof rubber spatula, until the butter is dark golden brown. Immediately remove the saucepan from the heat and stir in the brown sugar, then add the heavy cream. 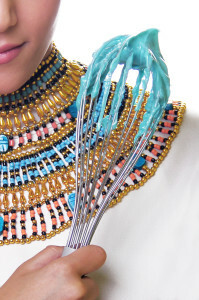 Return the saucepan over the heat and bring to a simmer, stirring constantly with a whisk or heatproof rubber spatula until the brown sugar has fully dissolved; about 1 minute. Let it cool briefly until thickened before pouring over the cake; about 15 to 20 minutes. Place the pecans in a medium skillet over medium heat. Stir with a spatula until just starting to toast and beginning to smell fragrant; about 1 to 2 minutes. Immediately add the sugar, stirring frequently until the sugar starts melting, then coating the nuts. Keep stirring until the sugar turn golden brown and caramelizes. Remove from heat and sprinkle with the sea salt (if using), stirring to coat. Transfer the nuts to a place to cool completely before adding over the cake. Recipe slightly adapted from this Ultimate Pumpkin Cake, swapping out sweet potatoes for the pumpkin puree as suggested by a dear reader, Yasmine Shorosh. Sounds and looks delicious, great combination of flavours. This is SO my kinda cake!!! I love no fuss, straight up cales like this. Something so comforting about them no? Also, BATATA!!! 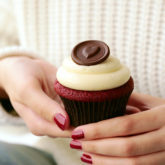 How can i resist??? 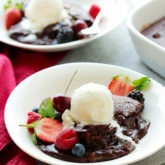 Do u think this would work with wholewheat flour? Might have to “risk” it and try this lol! Also…what if i use all brown sugar? No? You know I’m not a health freak like you when it comes to dessert so I have very limited experience with wholewheat flour in baking. However from what I know is that wholewheat flour tends to absorb more moisture than white flour. So I’m guessing it’s gonna work, but it might just end up denser. You might want to consider increasing the buttermilk just a bit to compensate for the excess absorption of moisture. 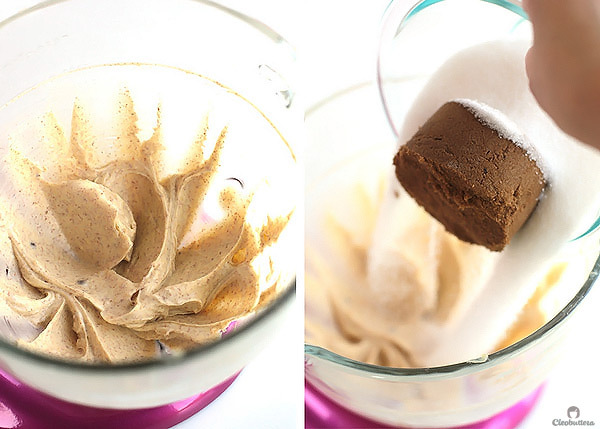 As for ALL brown sugar…definitely go with it! Abida that’s awesome! Thank you so much for adding me to your round up. What an honor?! Hi there. I’m wondering if I can make this ahead of time and freeze it? How long do you think it will last in the fridge? Hi Trina! 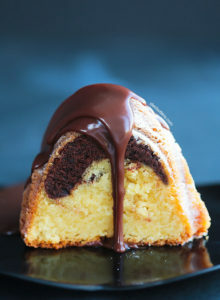 You could make the cake without the sauce and freeze it but up to a month. It’s better to make the sauce on the day you’re planning to serve it. 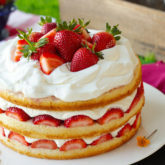 I actually don’t recommend refrigerating the cake, as chilling tends to dry cakes out especially those made with butter, but you could experiment if you like. The cake keeps well as room temperature for about 3 days. 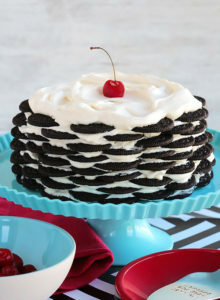 Haven’t tried to make this, YET! It looks like the perfect combo of some of my fave flavours, though. I think, the only thing i change, will be addition of rum soaked raisins. Just seems like the right thing to make it PERFECT for me & mine. Well, off to buy rum! Thx for recipe, i can hardly wait to make it!! Any suggestions on how we can achieve that? ?